GARDEN CITY, KAN. — The Lee Richardson Zoo, one of Garden City’s most visited attractions is mourning the loss of Kalmali, a seven year-old snow leopard. Kalmali was euthanized on Tuesday morning due to renal failure. Kali was one of the zoo’s main attractions and was loved by many at the zoo. 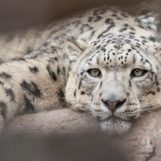 The Lee Richardson Zoo is currently working with the Snow Leopard Species Survival Plan to try and get a new snow leopard in to replace Kali.